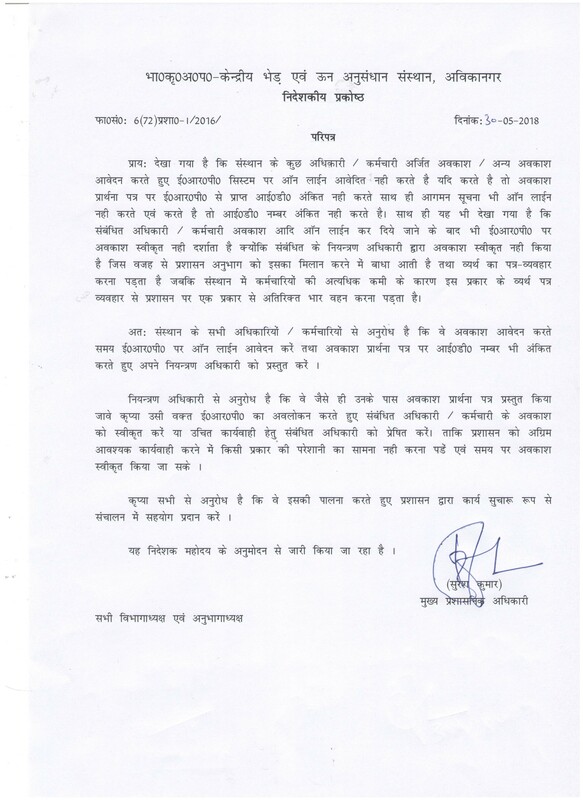 Swachhta Abhiyaan programme from 15.09.2018 to 02.10.2018. 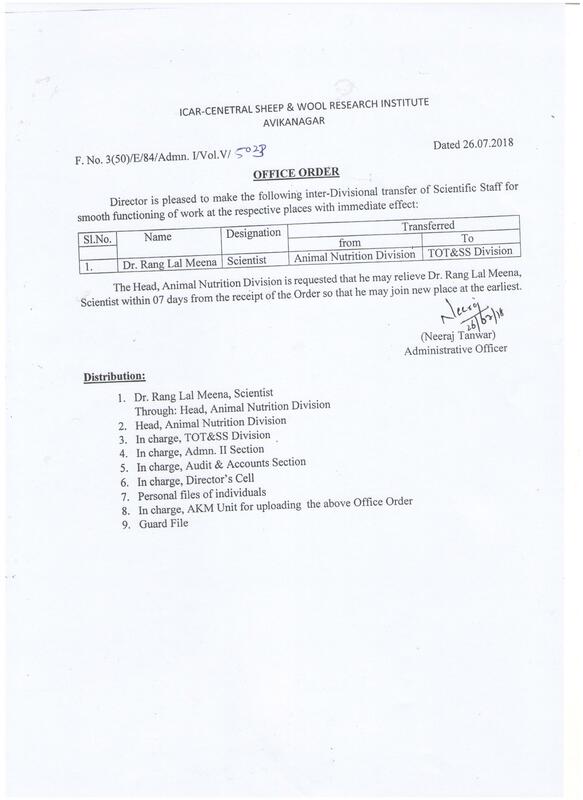 Relieving office order of Dr. Chandan Prakash, Scientist - reg. 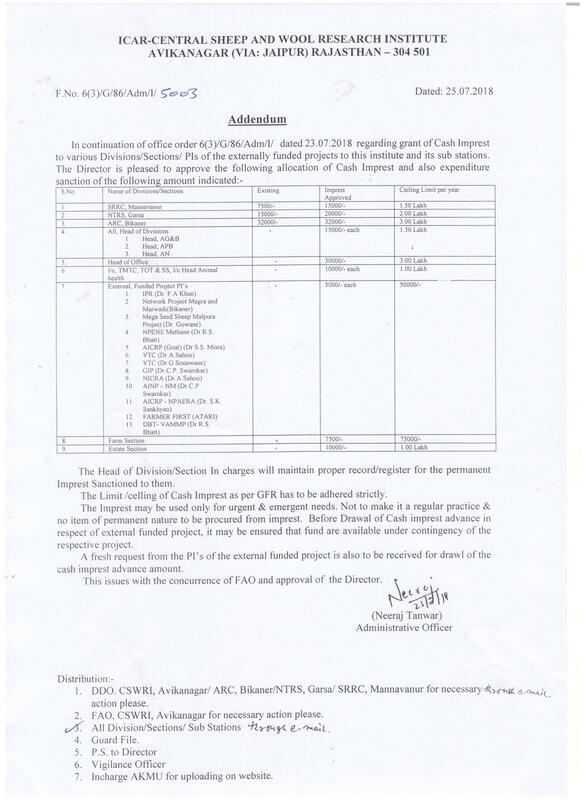 Grant of Cash Imprest to various Divisions/sections/PIs and sub-stations. 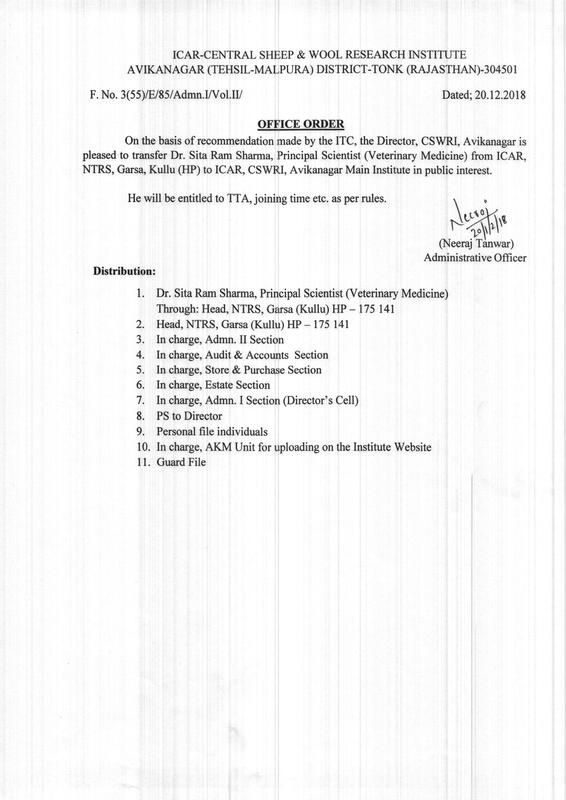 Dr. S.S. Dangi, Scientist(ani.Phy.) 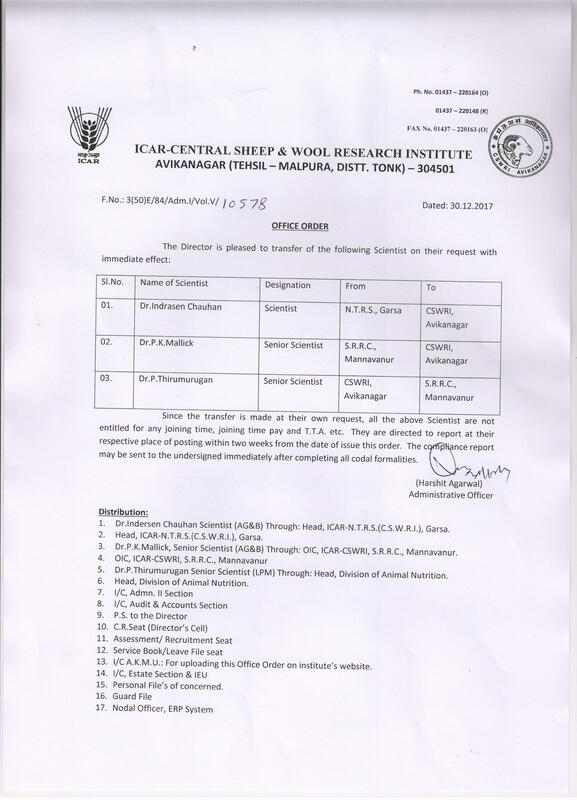 joined this institute on Dt.02-207-18. 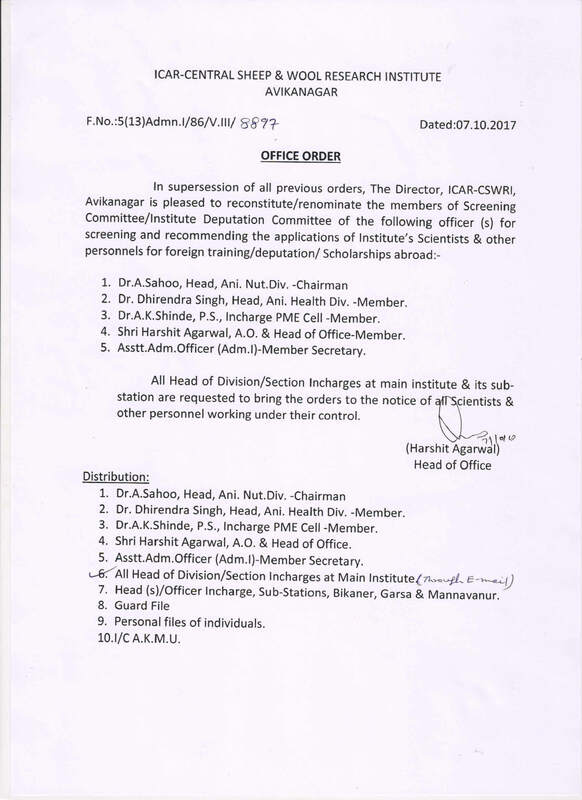 Cadre strength of Administrative, Technical and S.S.S. 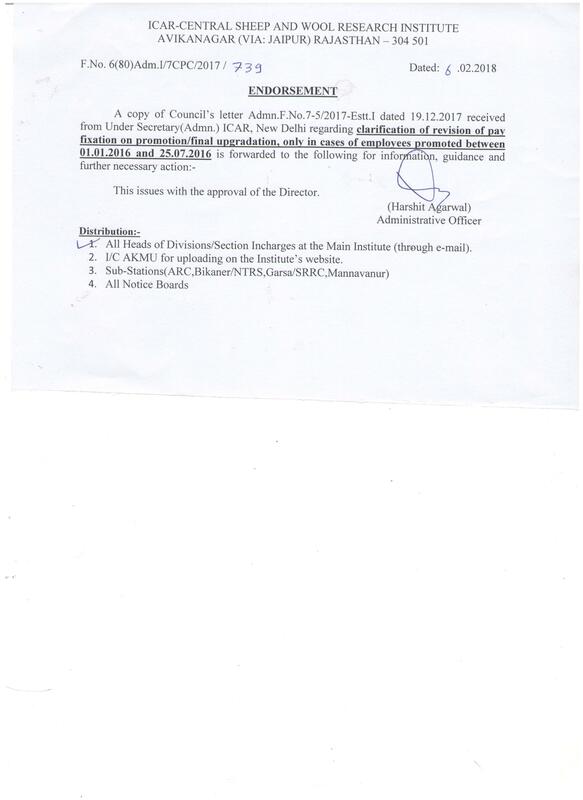 for Main Institute and Sub-Stations - reg. 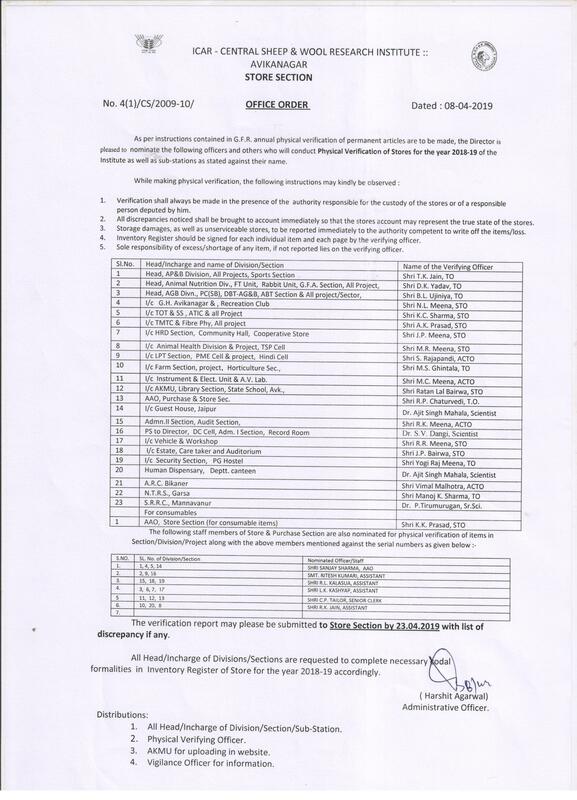 Final combined seniority list of Assistants upto 31.03.2018. 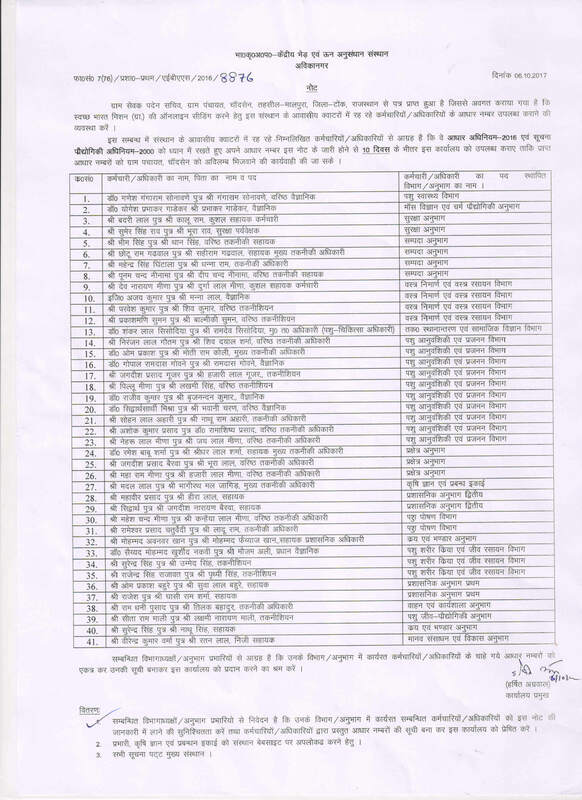 Office Order for routine duties In absence/tour of Shri Harshit Agarwal, AO - Reg. 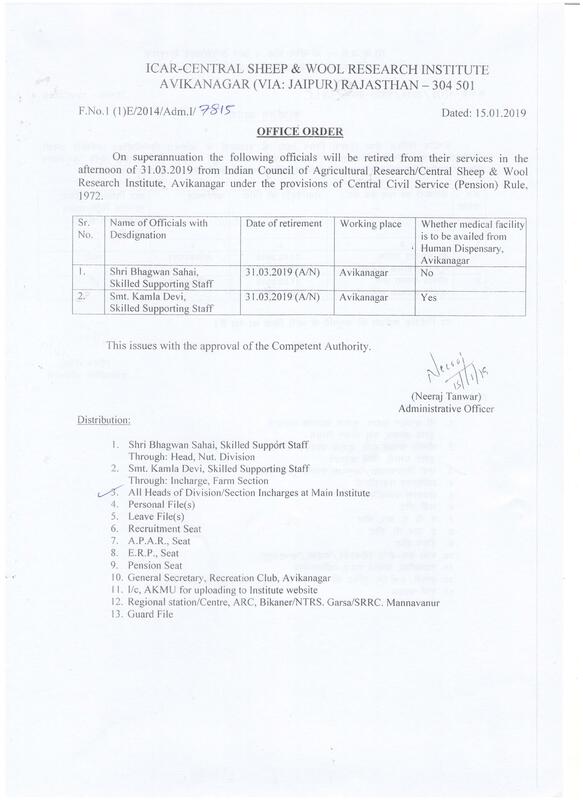 Office Order for routine duties In absence/tour of FAO - Reg. 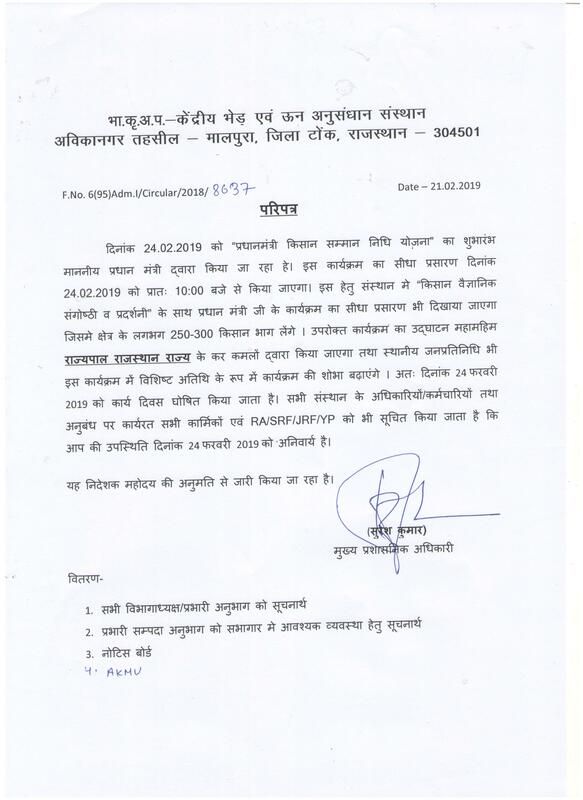 Regarding work of Quarter allottment seat to sh. 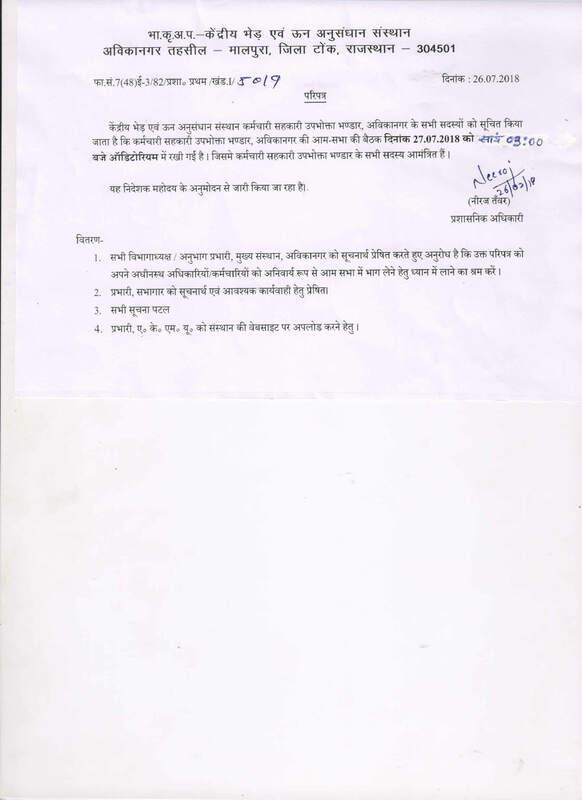 AK Meena, Asstt. 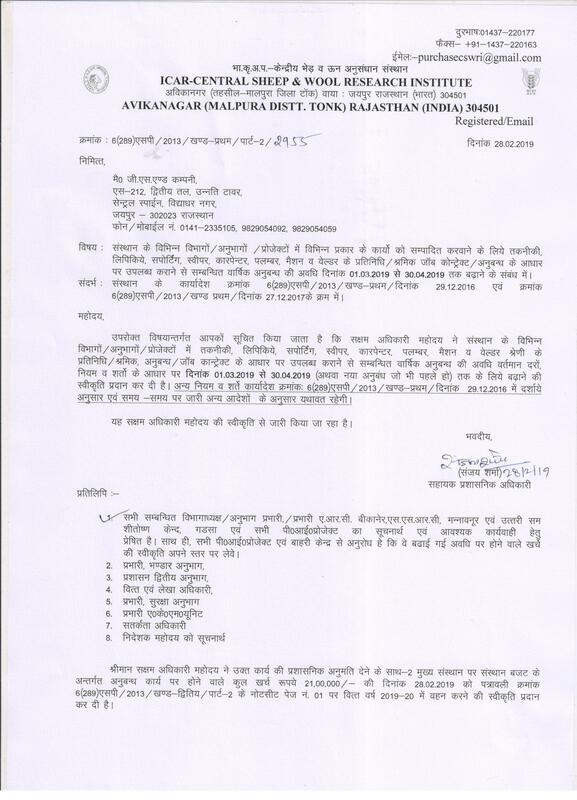 Office oreder for amendment in rates of Kishan hostal/GH jaipur facilities reg. 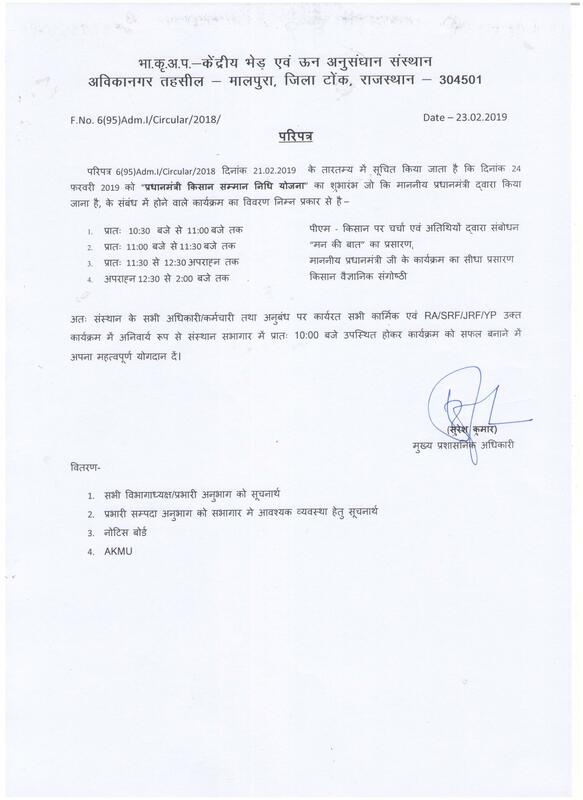 Notice for extension to complete online registration for T-1 exam. 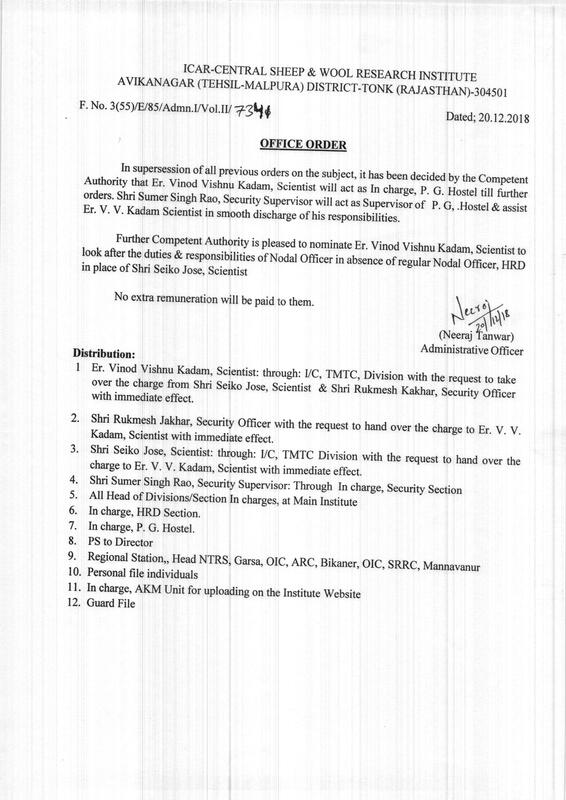 Office order for nodel officer CCTV. 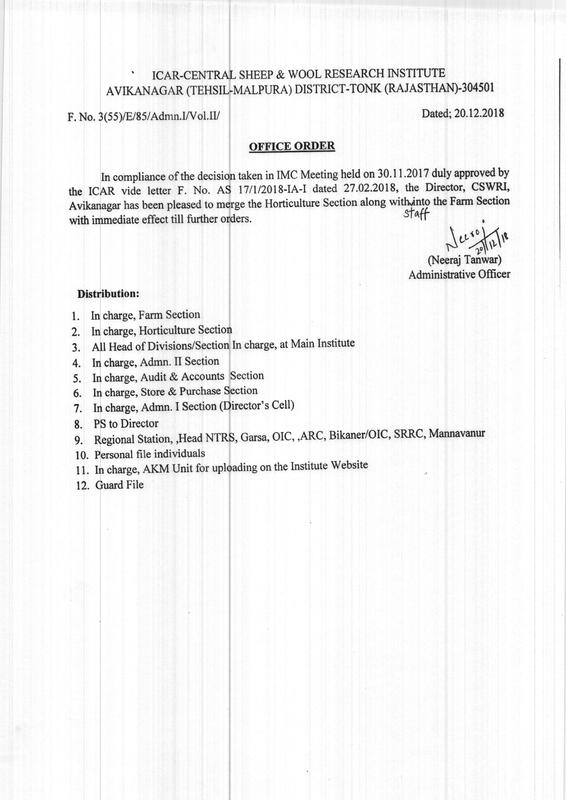 Regarding Administrative control of sections. 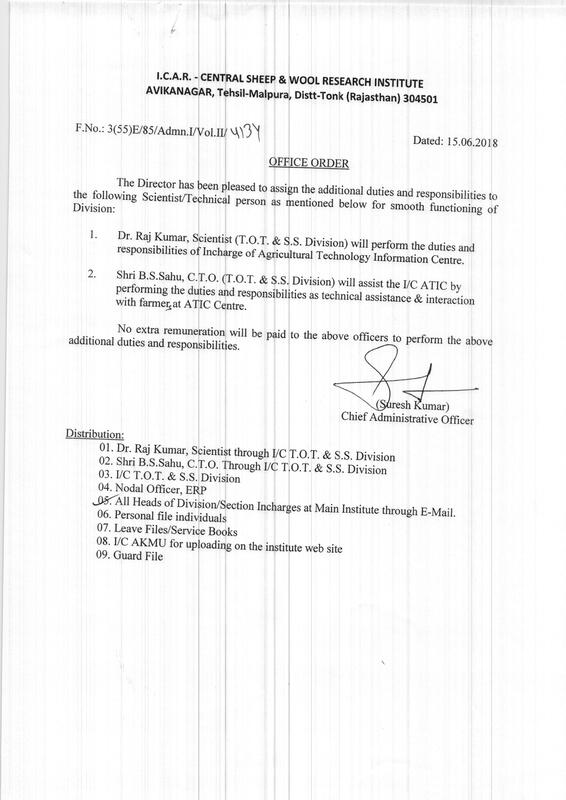 Joinning of Dr. Vinod Vishnu Kadam, Scientist in TMTC after availing study leave. 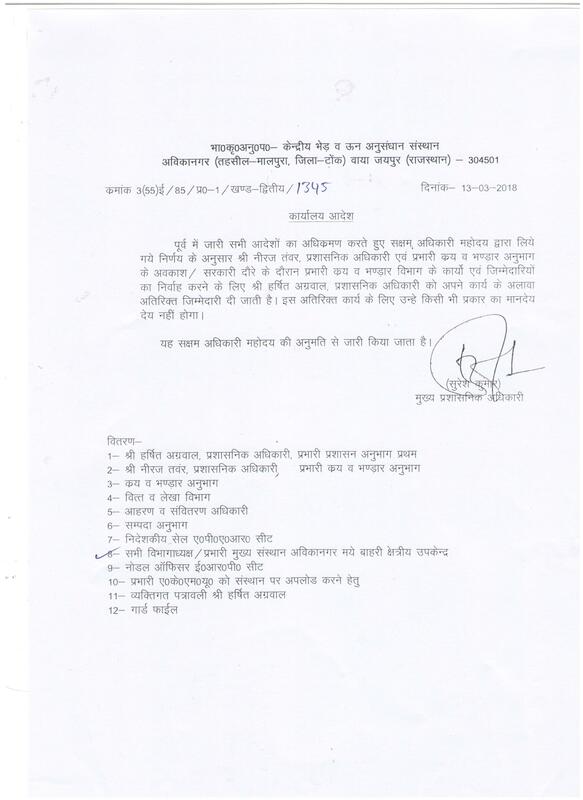 Relieving of Dr.A.K.Patel from the post of Head ARC Bikaner - reg. 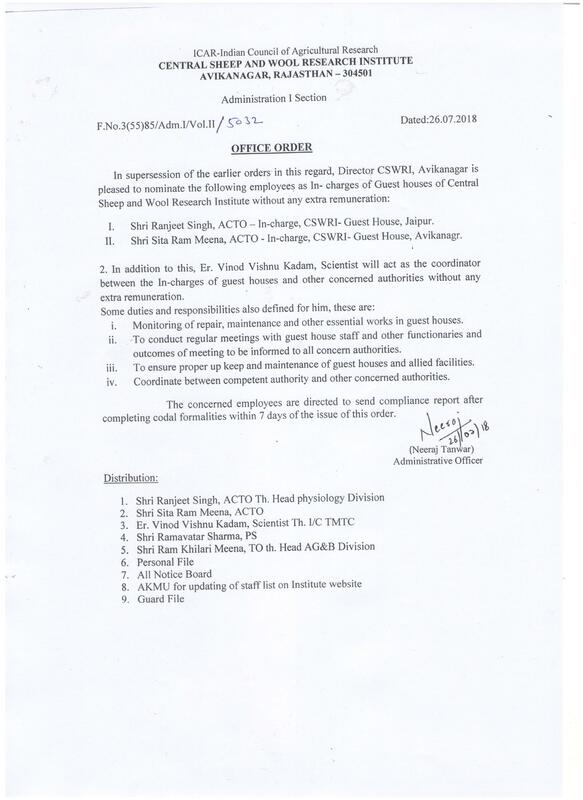 Transfer of Sh Suresh Kumar, CAO from CPCRI to CSWRI in public interest-reg. 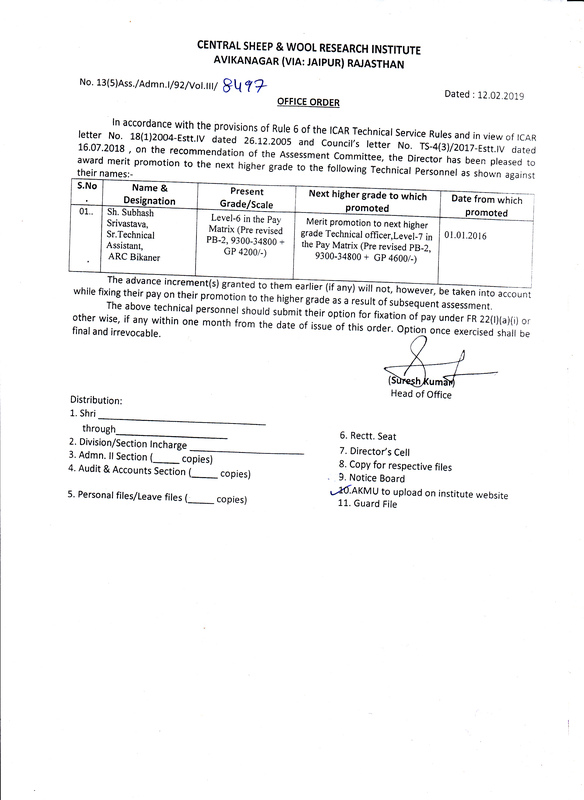 Proposal submission well in advance for external examinar. 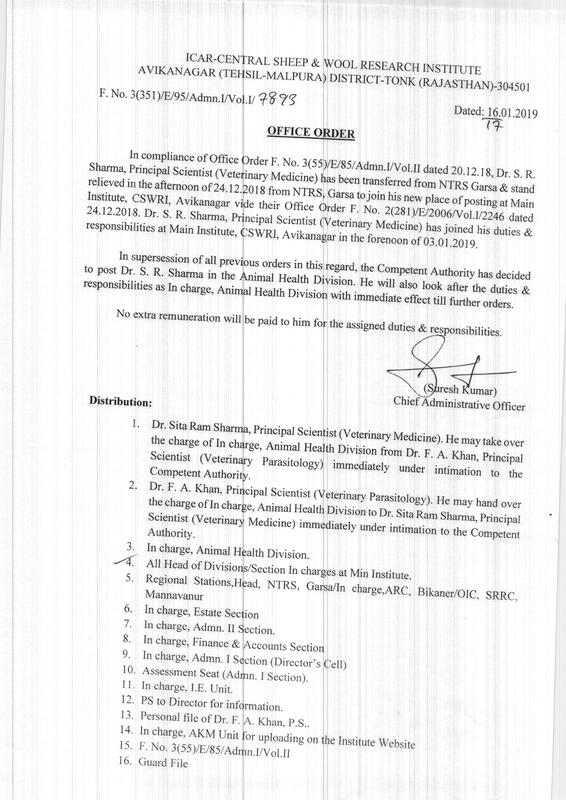 Office order for Incharge Human Dispensary Dr. A.Sahoo. Sh. 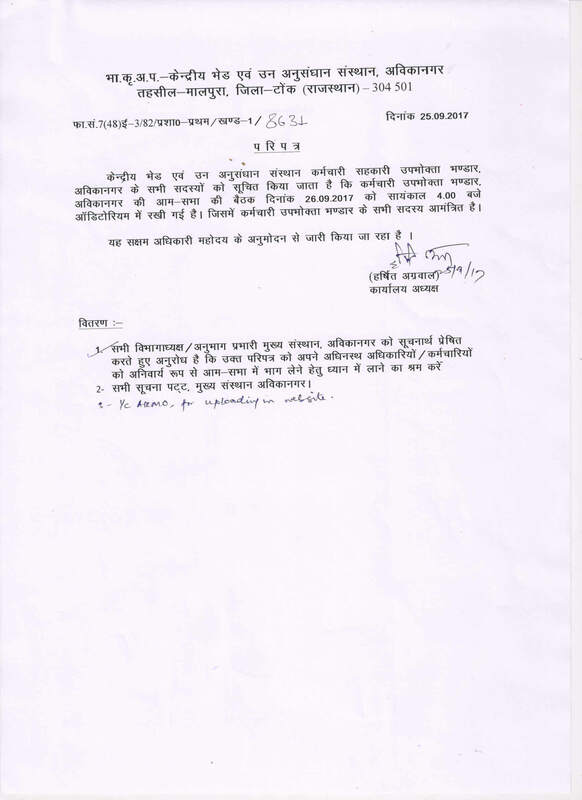 Malaram Dhanka, Techn. 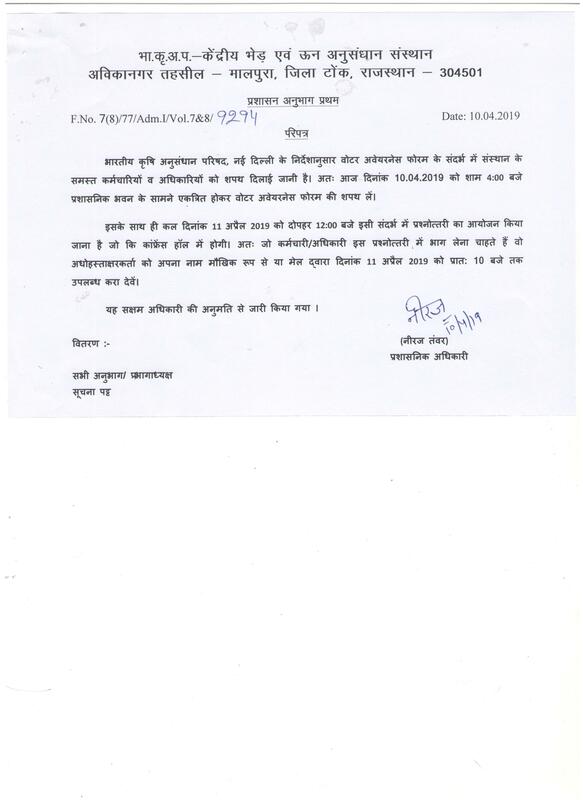 has jonined CSWRI, Main Office on 12.03.18. Dr G R Gowane Scientist AG&B has attended 11th congress on genetics applied to livestock at Auckland, New Zealand. Dr.G.R.Goawane Scientist has attended world congress at New Zealand. Dr.G.R.Goawane, Scientist has attended world congress at New Zealand. Dr.G.R.Goawane, Scientist has attended world congress, at New Zealand. Dr.G.R.Gowane, Scientist, AG&B has attended '11th congress on genetics applied to livestock' at Auckland, New Zealand. 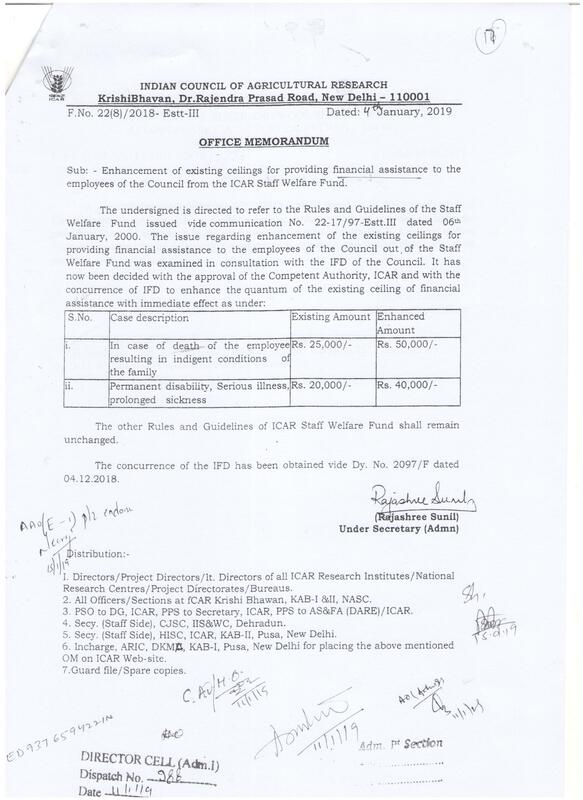 Payment of 2nd and final instalement of 7th CPC arrear. 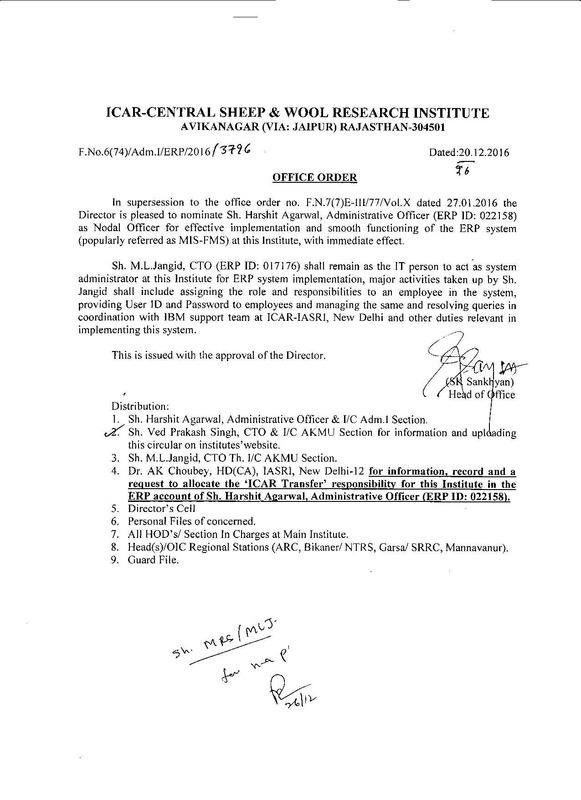 Office order for Incharge HRD and Noder Officer CWDB project. 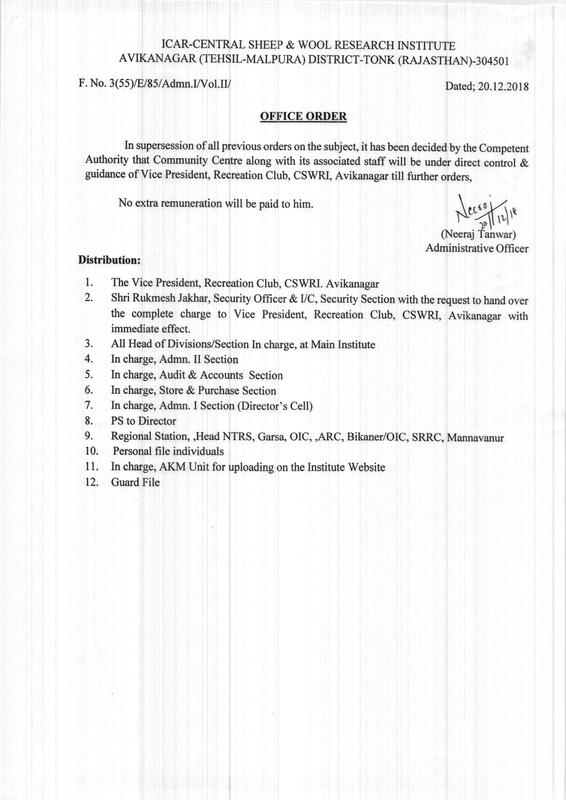 Complition of 25 years in ICAR service, Employee will be honour on Republic Day. 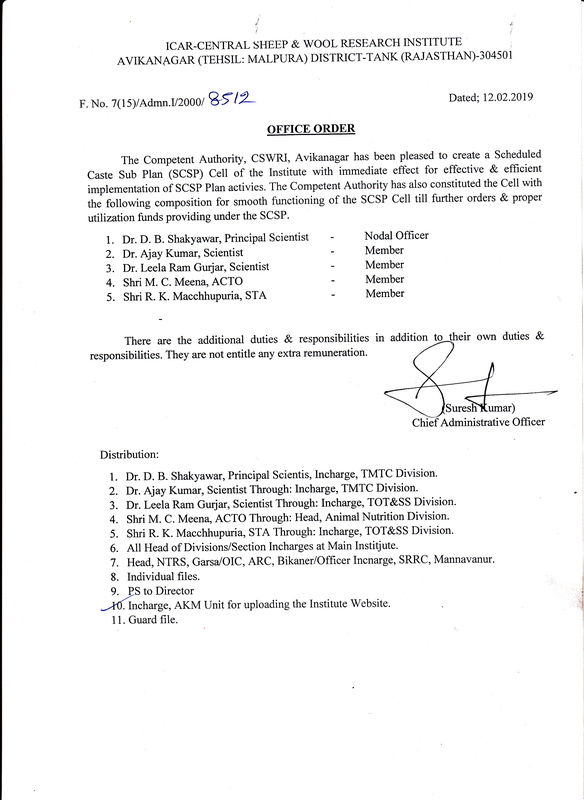 Inter institutional transfer of Smt K.Kangeshwari, Asstt. 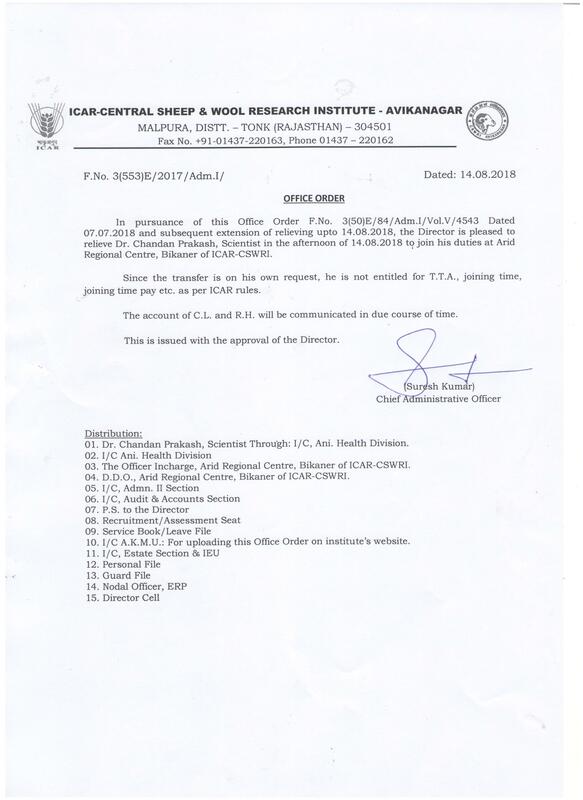 CSWRI-Mannavanur to SBI Coimbatore. 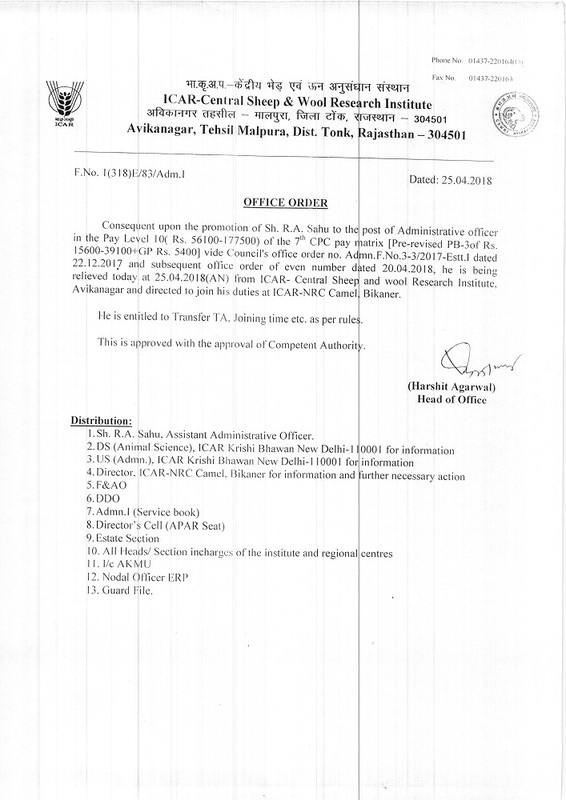 Office Order for routine duties In absence/tour of CAO,AO - Reg. Holidays for the year 2018. 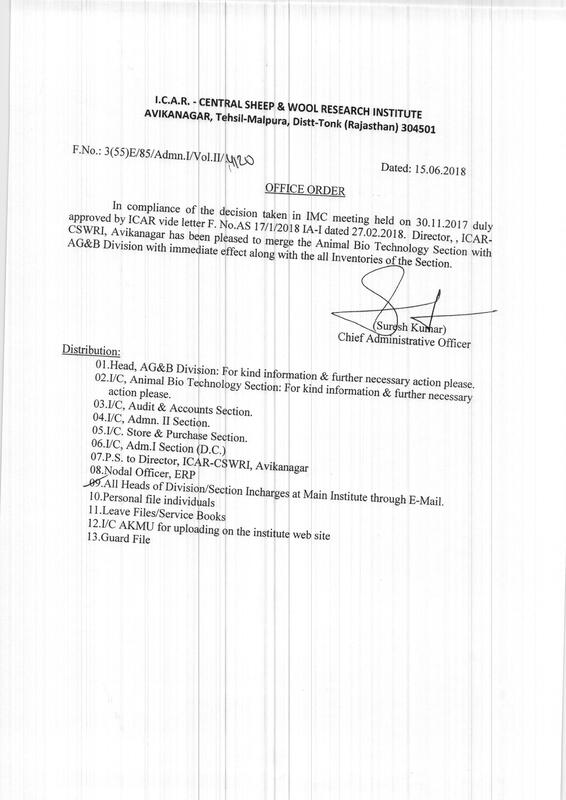 Office Order for routine duties In absence/tour of CAO - Reg. 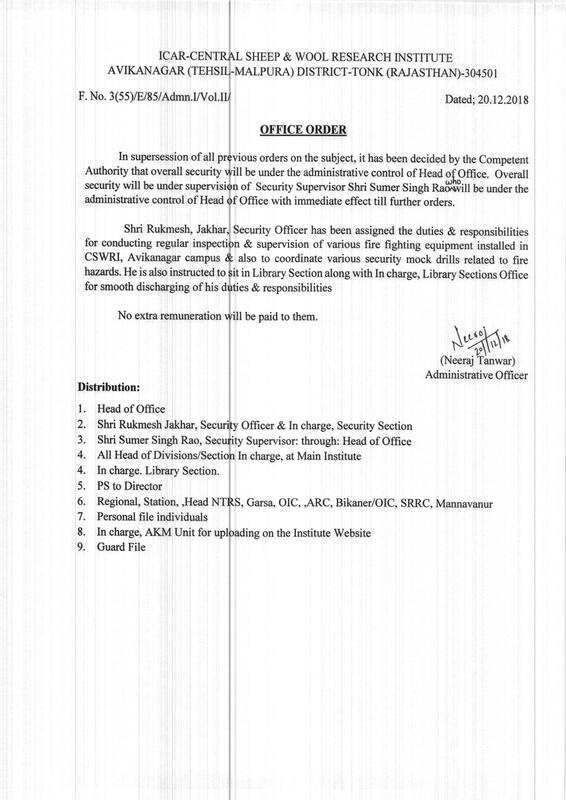 Office Order for I/c's of AKMU & Library Section. 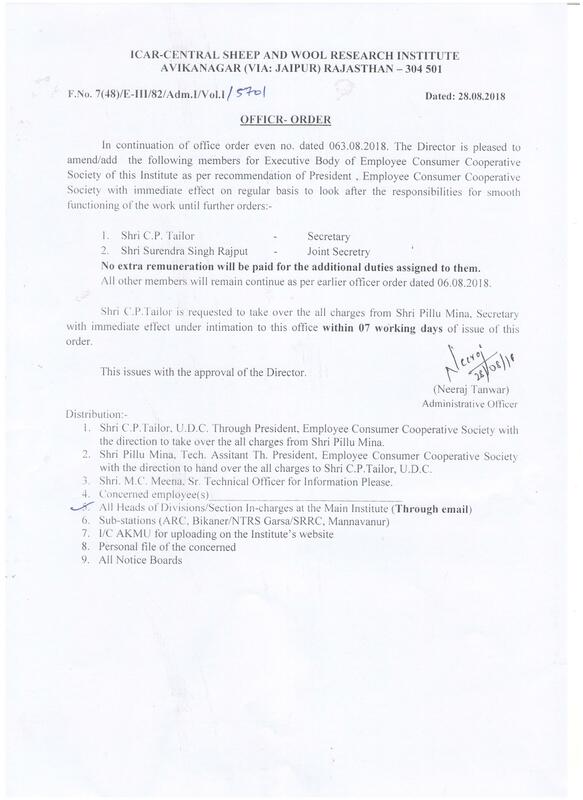 Internal Transfer of Technical Staff. 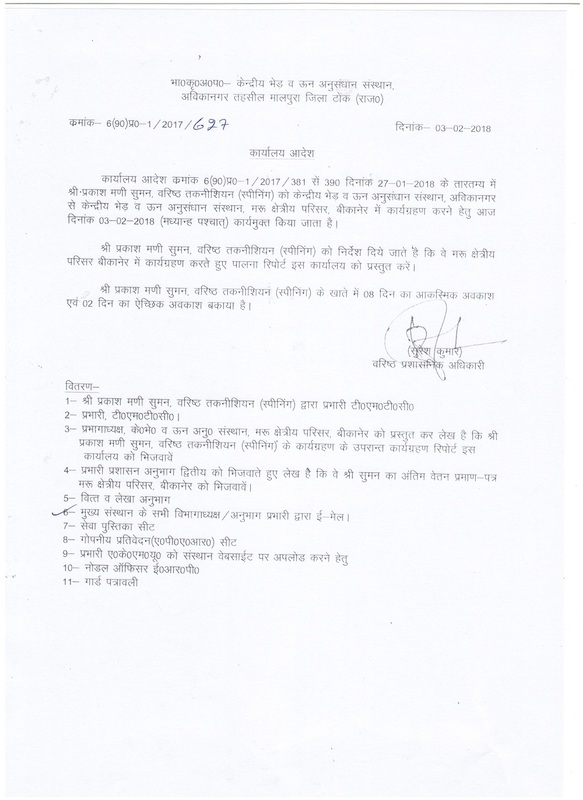 Office order for look after the routine duties of acting director. 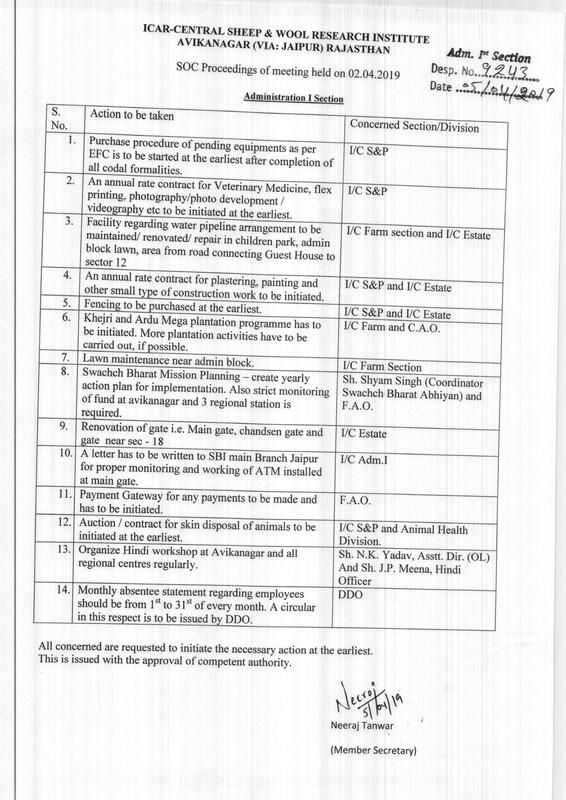 Simplification of procedure for treatment at Private Hospitals empanelled under CGHS/CS(MA) rules,1944. 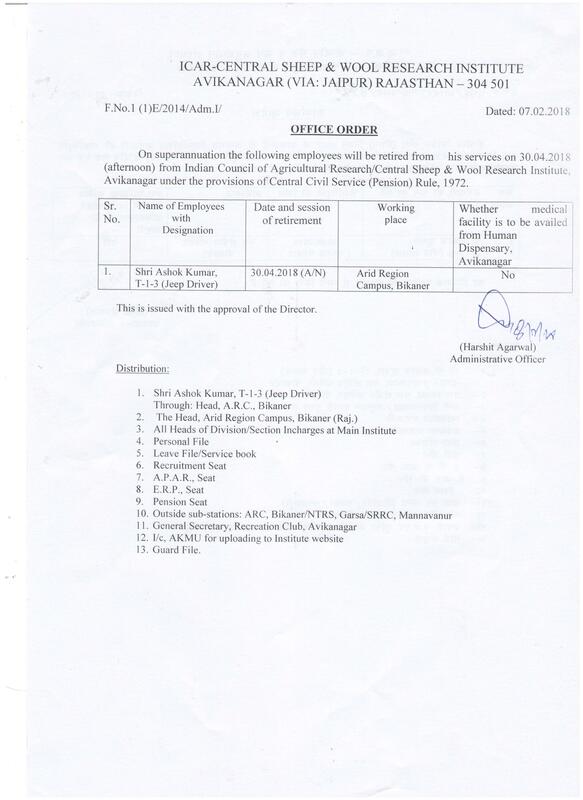 Office Order for In absence/tour of regular Head/Incharge of Division/Section - Reg. 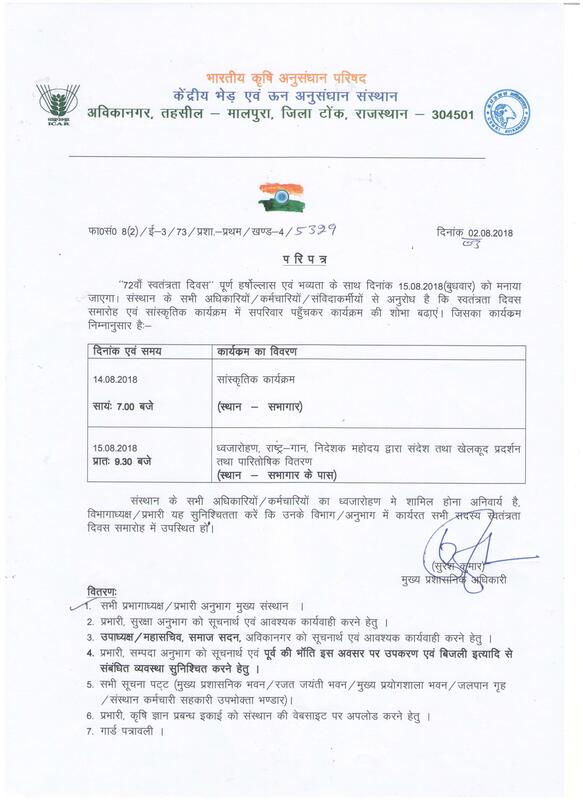 Celebrate Constitutional Day on 27-11-2017. 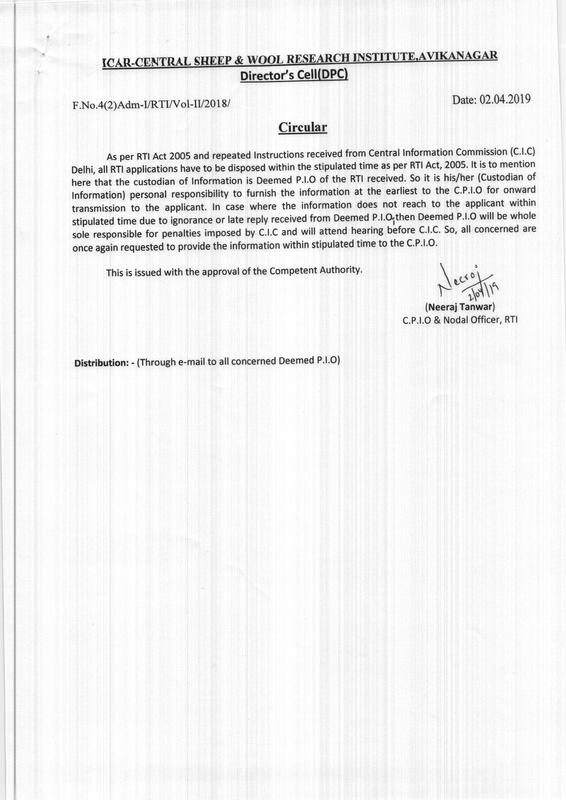 MACPs for the central govt. 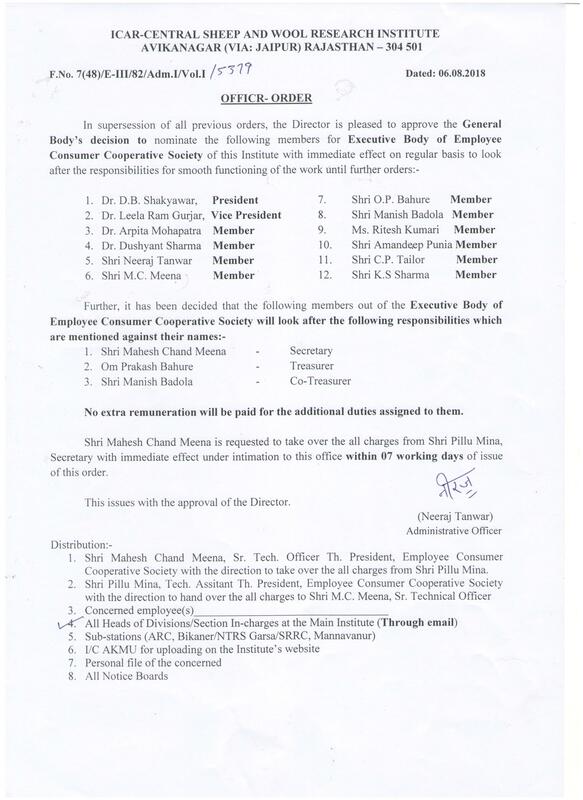 employees- Implementation of 7th CPC recommendations. 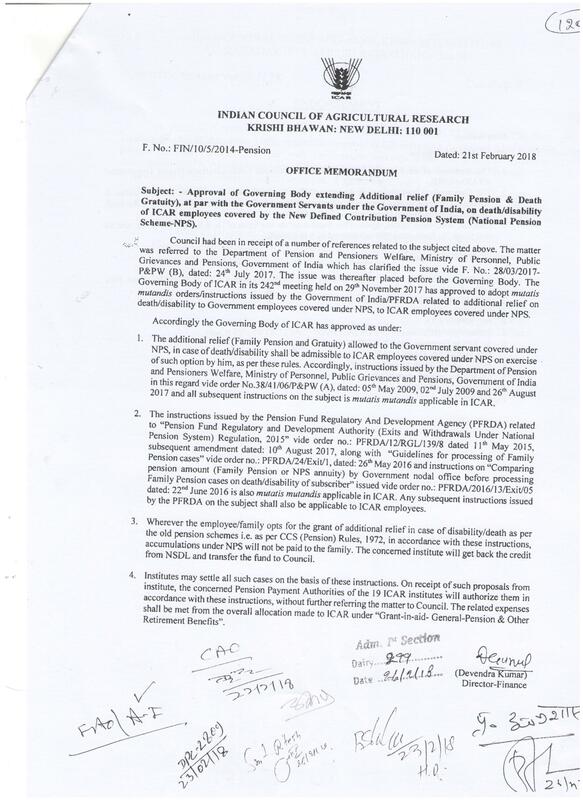 Implementation of PFMS in ICAR Institutes- reg. 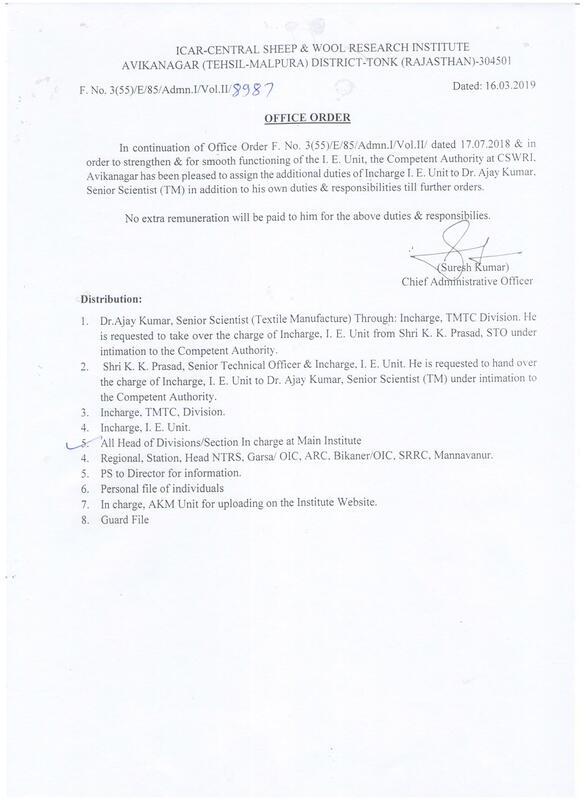 office order for internal transfer of technicals. Office order for incharge of Rabbit section. 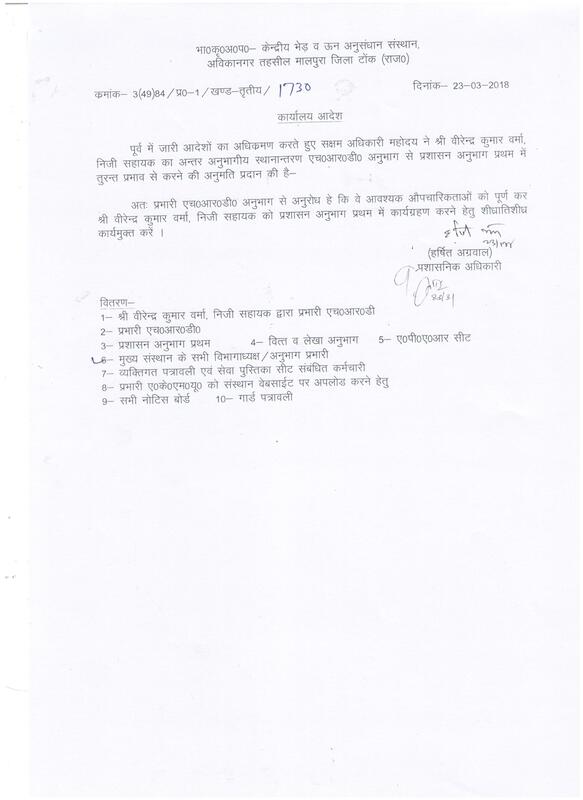 Committee to special drive before diwali make clean and tidy offices. 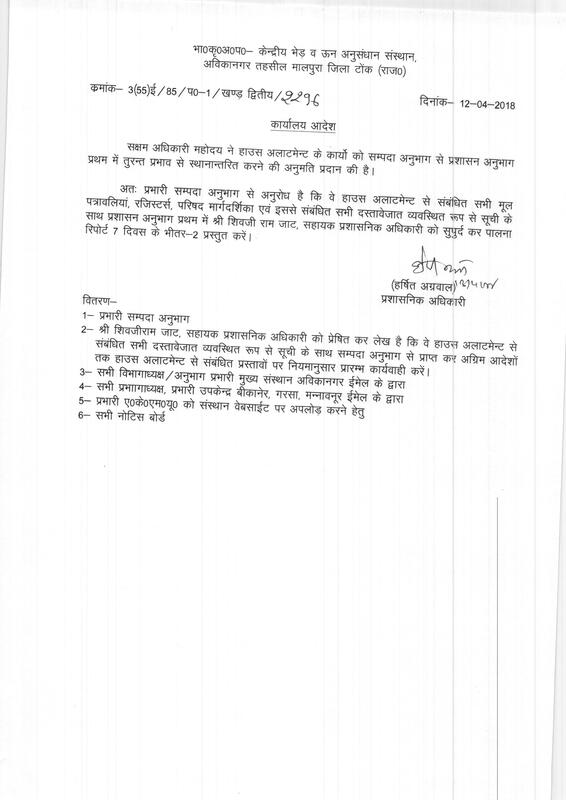 Extra benefit to women employee with disabilities when they have children. Fill the service details in the ERP module within FIVE days of Scientific cadre. 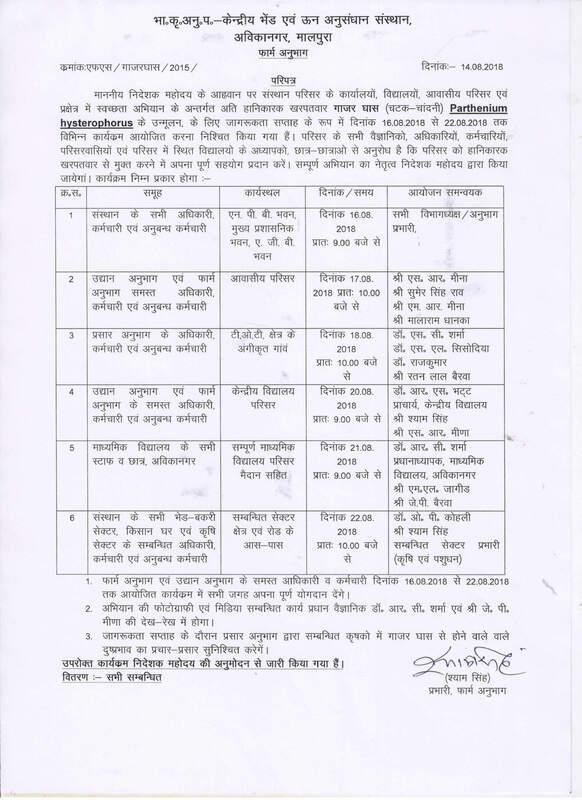 Guidelines on LTC issued by Govt. of India from time to time reg. 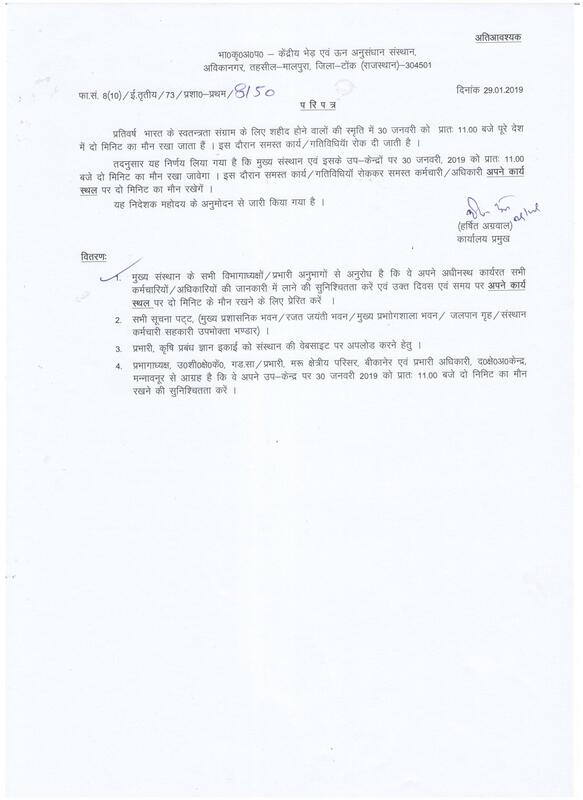 Economy in use of papers, restricting expenditure towards adv. 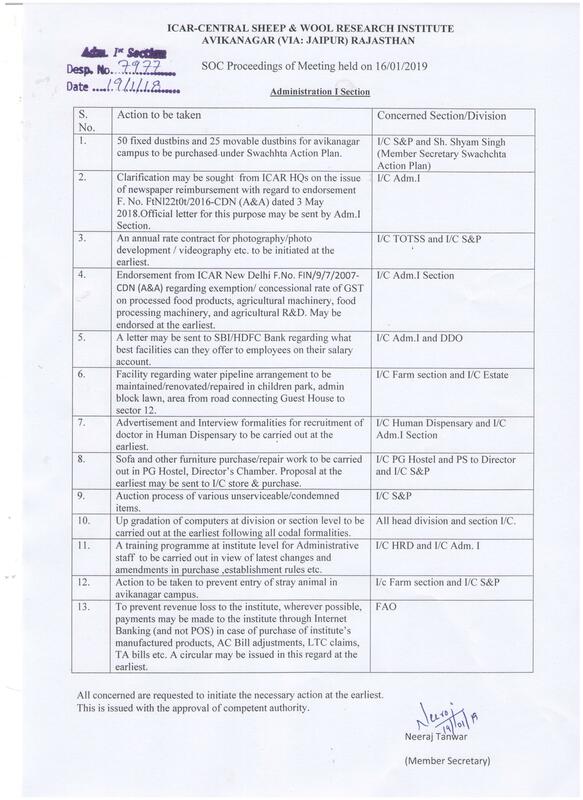 charges etc. 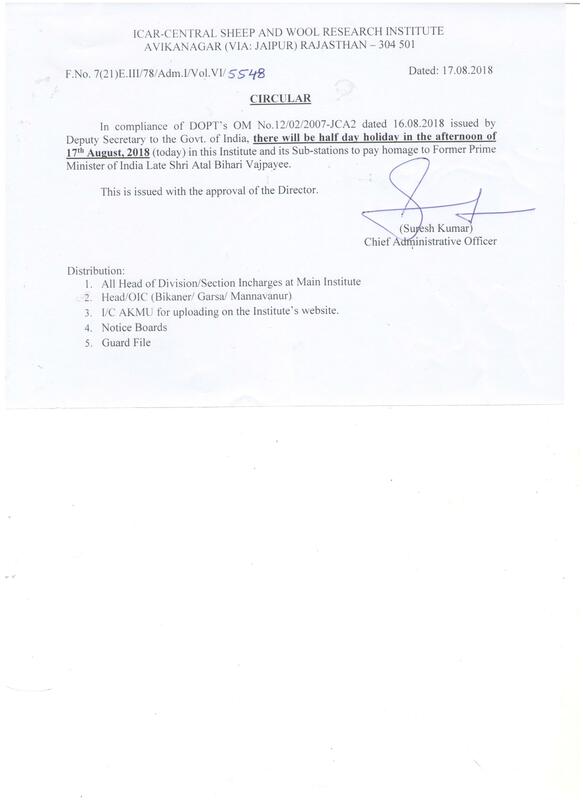 To send Monthely absentee statement with AEBAS monthly report of the staff duly verified to DDO from April'2017. 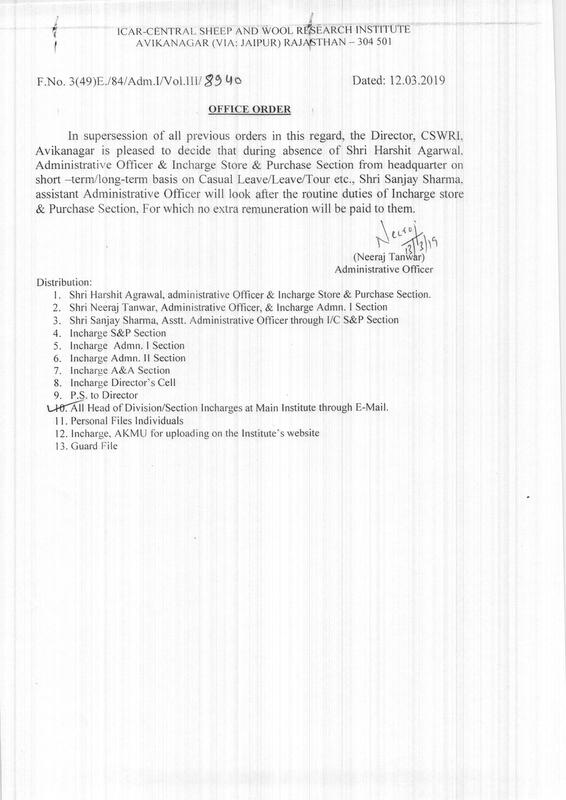 To consider gifting Khadiand village industries products during festivasl season - reg. Salary advance for the month of Nov., 2016-reg. 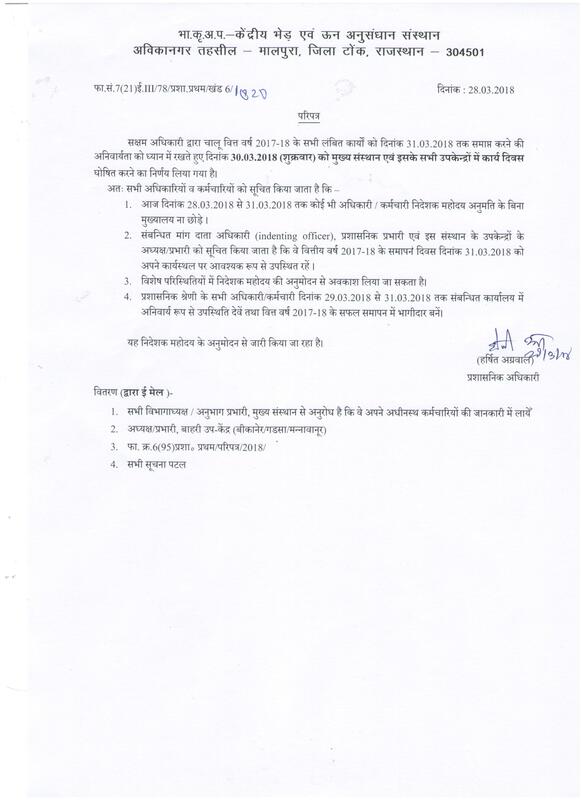 Issuance of ordinary passport to Govt. Servants-Reg. 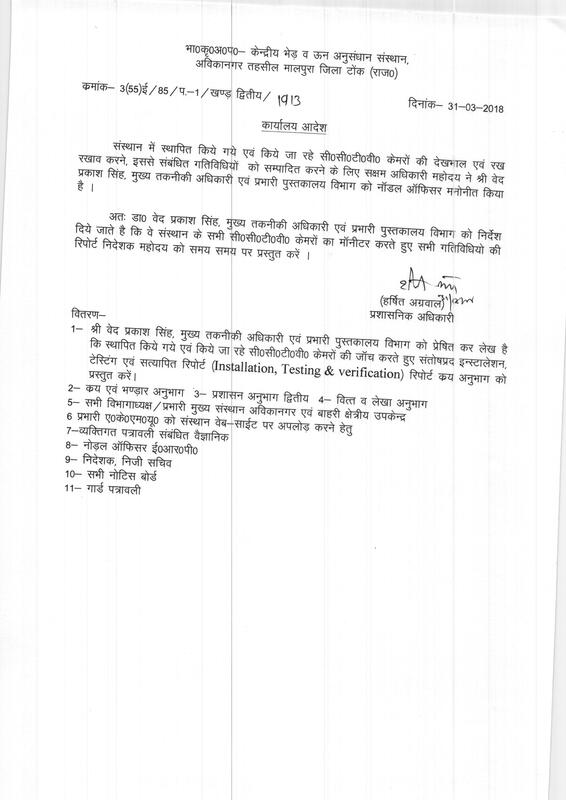 Guidelines fir Intra-Institutional transfer - reg. 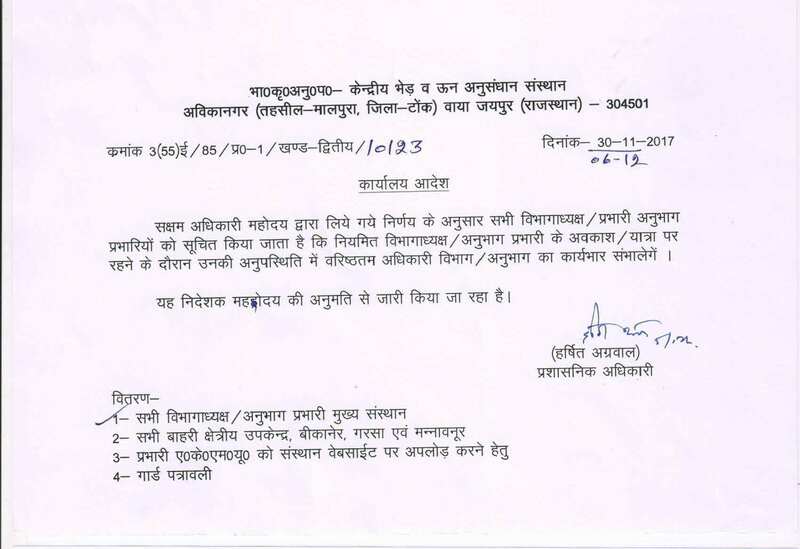 Reg.Central Civil Services (Leave Travel Concession) Rules, 1988 ��� Relaxation to travel by air to visit NER, J&K and A&N. 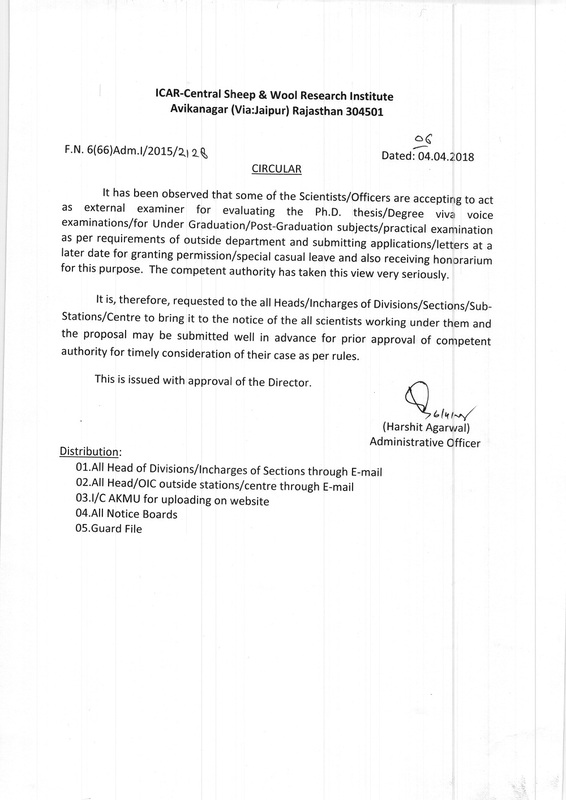 Guidelines and proceedure to be followed by scientific/technical staff who are intrested to apply for higher studies.